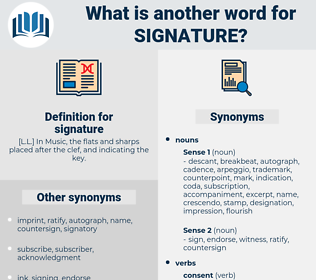 What is another word for signature? [ L. L.] In Music, the flats and sharps placed after the clef, and indicating the key. swaps, Firms, Companies, directors, signed. annexes, signed, Underwriting, firm, characteristic. signing, signed, signoff, sign-off, undersigned. signing, initialling, ratification, signoff, sign-off, subscription, scrawl. Pete sighed heavily when the matter had been adjusted, the identification signature slips signed, and the bank - book made out in his name. The one in William and this one in his own signature are almost identical. sinatra, secondary, saunterer, second-year, sonneteer, smoother, saunter, semi-dry, sanitary, squinter, smother, signatory, sociometry, sonometer, sequenator, shunter, sinter, sunder, seconder, sumatra, snow thrower, snow eater, smatter, senator, Simhat Torah, symmetry, sander, somateria, squander, sounder, some other, sentry, sundry, smotherer, scimitar, snow tire, squanderer, Simhath Torah, sender. 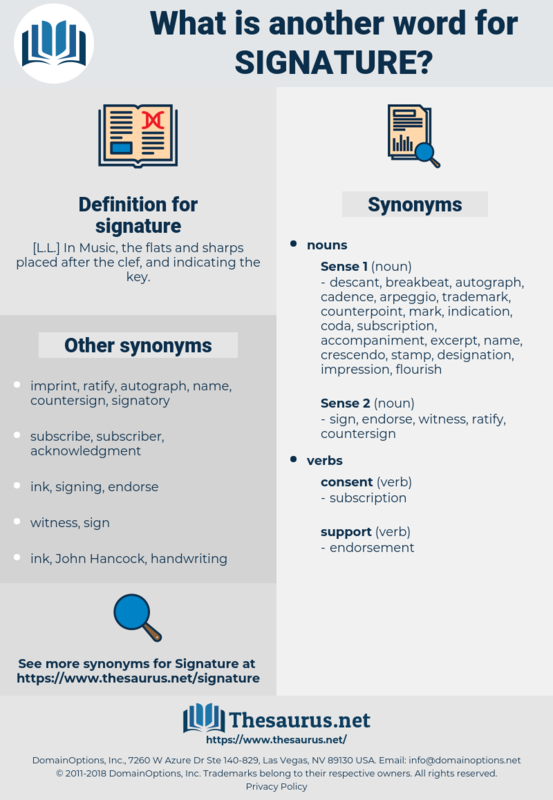 autograph, John Hancock, endorsement, Indorsement, countersignature, allograph, countersign, sign manual. style, manner, way, mode, fashion. piece of paper, name, sheet of paper, sheet.